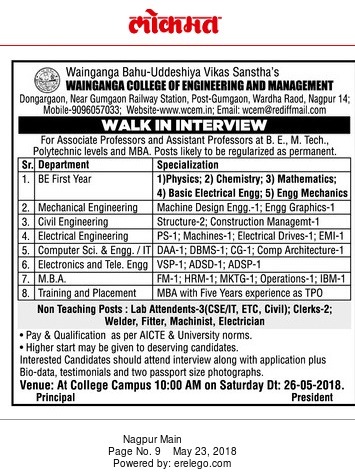 Wainganga College of Engineering and Management, Nagpur has advertised in LOKMAT newspaper for the recruitment of Faculty job vacancies. Interested and eligible job aspirants are requested to appear walk in on 26th May 2018. Check out further more details below. About College: WCEM was established in 2008 by Wainganga Bahu-uddeshiya Vikas Sansth’s(WBVS), a trust which has been involved in community service for over four decades. More than 10 years of existence has helped WCEM grow deep roots and establish a strong foundation in technical education. Journey of a student in this institute has always involved comprehensive knowledge building from practical skills, theoretical knowledge to personality development.